Cake is great. For birthdays, bake sales, or even just to bake for fun (like I often do!). I was given a box of Cherrybrook Kitchen Chocolate Cake Mix to try, and I was very excited. This cake mix was a bit different than ones I have used in the past- according to the front of the box, this cake mix was all natural, vegan, dairy free, peanut/nut free, and egg free! I also thought the front of the box was adorable- it looked as if there were two cartoon children standing on top of a piece of chocolate cake, flying a “piece of chocolate cake kite”. Adorable! What I noticed first after reading the instructions, was that this cake mix was made to make either 12 cupcakes or one 9-inch cake. I decided to use a pan instead of cupcakes, as I wanted to cut them into squares when I was finished. I also decided to swap 1/2 cup of applesauce for the 1/2 cup of vegetable oil that was called for. I sometimes do this when I bake breads or cakes- I can’t tell the difference! I poured the cake mix, water, and applesauce in a bowl. The cake mix itself looked like a soft brown cocoa powder, and smelled absolutely delicious- just like a chocolate bar. I started mixing, and was puzzled at first. Why aren’t these bumps going away? Then- surprise! They were chocolate chips! I had no idea they were in the cake mix! Then I poured the cake batter, which was a good consistency- easy to pour- into my pan and put it into the oven. When it was done cooking, it certainly puffed up! They were a deep chocolate brown, with “crispy-type” edges bordering the pan. Unbleached flour [wheat, malted barley flour, niacin, reduced iron, thiamine mononitrate, riboflavin, folic acid], evaporated cane juice, non-dairy chocolate chips [sugar, chocolate liquor, dextrose, cocoa butter (no dairy derivatives), soy lecithin, pure vanilla extract], natural cocoa powder, all natural vanilla flavor, baking soda, sea salt. I think it’s pretty obvious that I love nut butters, and I also love honey. So you can bet I was happy when Once Again Nut Butter Inc./ Dawes Hill Honey sent me three products to try. 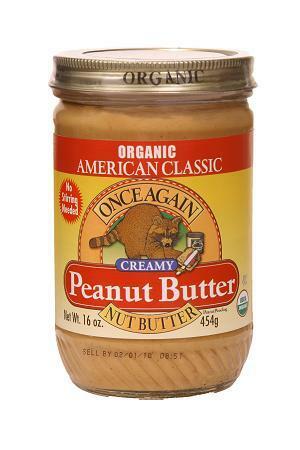 By Once Again Nut Butter Inc. was the Organic American Classic Creamy Peanut Butter and Organic Cashew Butter, and by Dawes Hill Honey, the Honeycreme. Let’s start with the nut butters! Now onto the Honeycreme from Dawes Hill Honey! 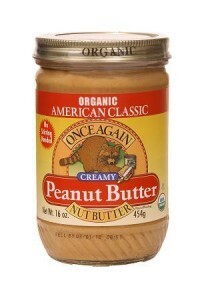 Organic American Classic Creamy Peanut Butter- 2 Tbsp. 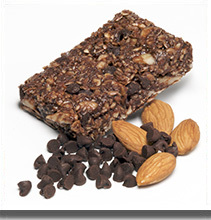 is 190 calories, 15 grams of fat, 7 grams of carbohydrates, 2 grams of fiber, 2 grams of sugar and 7 grams of protein. Dry Roasted Organic Peanuts, Organic Palm Oil, Organic Sugar, Salt. Organic Cashew Butter-2 Tbsp. is 180 calories, 15 grams of fat, 9 grams of carbohydrates, less than 1 gram of fiber, 2 grams of sugar and 4 grams of protein. Organically Grown Dry Roasted Cashews, Expeller-Pressed Organic Sunflower Oil. Honeycreme- 1 Tbsp is 60 calories, 0 grams of fat, 17 grams of carbohydrates, 16 grams of sugar and 0 grams of protein. Penny’s Low Fat Desserts is a favorite here on HealthNuttxo. I haven’t met a product I haven’t liked- ranging from muffin tops, muffins and even no sugar added cookies! Another favorite of mine to add is now the White Chocolate Cranberry Cookie, which was sent to me to try from Penny. At first glance, I was quite pleased. A decently sized cookie- and quite thick too. I tasted this cookie and was equally as happy. It had a fruity taste, which I would imagine is from the “dried plum puree” listed in the ingredients, but also reminded me of an oatmeal raisin cookie. However, instead of raisins, were sweet and not-to- tart cranberries. I was actually quite happy the cranberries were not tart, as I usually am not a fan of cranberries for that reason. Not the case here! They were sweet and just plain good! Onto the best part of the cookie… the white chocolate chips. WOW! Soooo goood! Creamy and sweet, they added an unexpected and yummy twist to the cookie. They even had a slight crunch to them which was quite nice. 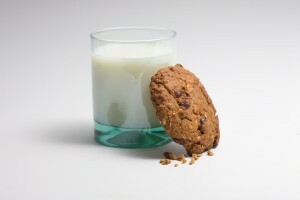 1 cookie is 150 calories, 2.5 grams of fat, 39 carbohydrates, 7 grams of fiber, 21 grams of sugar, and 2 grams of protein. sugar, whole wheat flour, water, white chocolate chips (sugar, cocoa butter, whole milk powder, nonfat milk powder, soy lecithin, vanilla, natural flavor), dried cranberries, oats, dried plum puree, cellulose, erythritol, chicory root, corn syrup, rice syrup solids, natural flavors, palm oil, baking soda, salt, soy lecithin, xanthan gum, sodium alginate, guar gum. Nature’s Path is one of my favorite brands when it comes to snacks, cereals, oatmeals, etc. I love that their products are made with wholesome, real ingredients. To me, Nature’s Path seems like a company that really cares about the food they make. Each bar is chewy and actually some-what dense. What I liked was that these had good “holding power”- meaning to me that they didn’t fall apart SUPER easy, which I find can happen with hewy-type granola bars. They were still soft, of course, but held together quite nicely. Overall, these are really tasty! I love that they are organic and provide some whole grains per bar. I think I will use these as a pre-workout snack or maybe as a light breakfast on the go with some yogurt and fruit, as they are a little short on protein and fiber for me to be eaten alone. I definitely recommend these- very tasty, and worth giving a try! 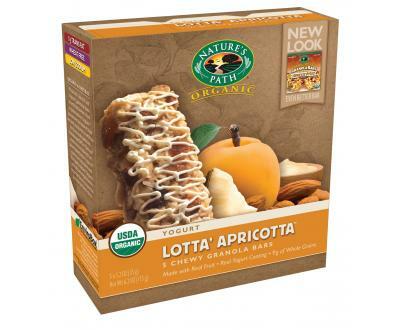 Lotta’ Apricotta- 1 bar is 140 calories, 5 grams of fat, 23 grams of carbohydrates,12 grams of sugar, 2 grams of fiber, and 2 grams of protein. Berry Strawberry-1 bar is 140 calories, 3.5 grams of fat, 25 grams of carbohydrates, 11 grams of sugar, 2 grams of fiber, and 2 grams of protein. For ingredient information and more, you can visit here. I was sent the Brownie and Very Berry flavors to try from Granola Gourmet. Overall, these are good. I like that they provide some whole grains, are dairy and wheat free, and are all natural! I think the Brownie flavor is the better of the two, as it had a good amount of sweetness and helped me when I was craving something chocolatey. If you would like to buy these bars, you can visit this website. I was a little skeptical at first myself, but I decided, why not? 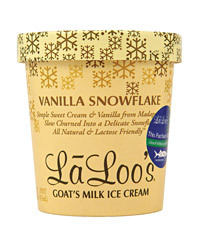 Laloo’s sent me some coupons to try some free goat’s milk icecream, so I picked up a container of the Vanilla Snowflake. This icecream is all natural, and according to the container is also lactose friendly! I opened up the container, and it was a pale yellow in color, sort of reminded me of the color of custard. When I took a scoop with my spoon I just knew this was going to be good. As I dug my spoon in, the ice cream was easily removable- it was super soft and velvetty in texture. I took a bite, and was amazed at this flavor. Where have you been all my life! I thought. This stuff was SERIOUSLY good! It was super creamy and rich, and had that melt-in-my-mouth consistency. Just absolutely perfect in my opinion. I’m not even normally a fan of vanilla- I usually opt for strawberry ice cream/frozen yogurt, or chocolate, or cookie dough! I normally find vanilla rather bland, but that is SO not the case here! It was perfectly sweet and had a lovely vanilla flavor. I think Laloo’s named this ice cream perfectly with “Vanilla Snowflake”. 1 serving, 1/2 cup, is 140 calories, 6 grams of fat, 18 carbohydrates, 0 grams of fiber, 14 grams of sugar, and 5 grams of protein. I will now be posting all future giveaways on the new “Giveaways” Page located at the top. I will also be a part of Giveaway Scout, which is a website that posts giveaways and helps spread the word about them on places like Twitter, facebook, etc. Here is a link to Giveaway Scout. Each package comes with 2 bars, for a total of 42 grams. What I liked about these bars was that although they were crunchy, they were NOT super hard. It was sort of a “soft” crunch, and was really quite enjoyable! 2 bars is 190 calories, 9 grams of fat, 25-26 grams of carbohydrates, 3 grams of fiber, 10-11 grams of sugar, and 4-5 grams of protein. Peanut Butter- Organic Rolled Oats, Organic Evaporated Cane Juice, Organic Sunflower Oil, Peanut Butter, Peanut Butter Chips (Evaporated Cane Juice, Palm Kernel Oil, Peanut Flour, Soy Lecithin), Rice Crisp (Rice Flour, Barley Malt Extract, Evaporated Cane Juice, Salt, Calcium Carbonate), Honey, Organic Barley Flakes, Organic Rye Flakes, Roasted Peanut Extract, Oat Bran, Oat Fiber, Sea Salt (Real Salt®), Natural Flavor, Inulin (Chicory Extract). White Chocolate Macadamia Nut-Organic Rolled Oats, Organic Evaporated Cane Juice, Organic Sunflower Oil, Soy White Chocolate (Organic Evaporated Cane Juice, Cocoa Butter, Soy Flour, Soy Lecithin, Vanilla Extract), Roasted Macadamia Nuts, Rice Crisp (Rice Flour, Barley Malt Extract, Evaporated Cane Juice, Salt, Calcium Carbonate), Organic Barley Flakes, Organic Rye Flakes, Oat Bran, Oat Fiber, Sea Salt (Real Salt®), Natural Flavors, Inulin (Chicory Extract). 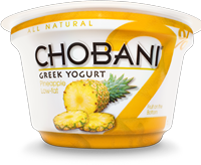 Chobani 2% Pineapple Greek Yogurt is now one of my new favorite flavors of greek yogurt. Chobani sent me some samples to try, including the 2% Pineapple Greek Yogurt. At first, I was a little skeptical. Why 2%? Why not fat free? I mean, this yogurt was 160 calories with 2 grams of saturated fat! But now I know! I really COULD taste the difference between a 0% Chobani and a 2% Chobani. Although both are delicious in my opinion, this yogurt was truly something special. One of the freshest, and creamiest tasting yogurts I have ever had. The pineapple part in my yogurt was actually not just on the bottom, but I experienced pineapple flavor throughout the entire yogurt. It was a sweet pineapple, that was throughly enjoyable. The yogurt itself was creamy and thick, and I could actually taste the cream. So. Good. I think the next time I get this yogurt I might freeze it a little bit, sort of like pineapple frozen yogurt! Overall, need I say it? 5 stars ! This yogurt is all natural, gluten free, and high in protein. Although it does have 2 grams of saturated fat per yogurt, it’s just too delicious to pass up. 1 yogurt is 160 calories, 2.5 grams of fat, 21 carbohydrates, 18 grams of sugar, 0 grams of fiber and 13 grams of protein. Cultured Pasteurized Nonfat Milk, Cream, Pineapple, Evaporated Cane Juice, Pineapple Concentrate, Pectin, Locust Bean Gum, Natural Flavor, Turmeric (for color). Congrats!! Please e-mail me your info so your package can be shipped out!